The Taoiseach said “slow, painstaking” action was needed to fix our problems – but again ruled out imposing losses on private bondholders. ENDA KENNY HAS said that he remains optimistic about Ireland’s future, despite the serious difficulties that face the country. The Taioseach said there was “no magic wand” to fix our financial problems, which would only be resolved by “slow, painstaking” measures. Speaking at a Reuters event in London, Kenny again ruled out imposing losses on private sector bondholders during Ireland’s bid for economic recovery. He said that the Greek situation – in which private investors are being asked to take a 50 per cent ‘haircut’ on debt – was “unique to Greece”. We want to be the first country to emerge from a bailout programme. During a visit to London for talks with UK prime minister David Cameron, Kenny spoke of his disappointment that Britain had not been included in December’s European agreement on future financial measures. Speaking outside No. 10 Downing Street just after 12.30pm, Kenny said that it was “vital” that the UK stays in the EU and that he had told Cameron that in his talk with him. Kenny said it would not be clear whether a referendum was required until the final text of the agreement had been published. But he said the EU market held huge potential for Ireland as a small open economy. 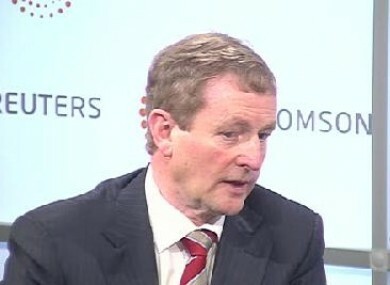 After his talk with David Cameron, Kenny said that whether a referendum will be held will depend on the advice he receives from the Attorney General Máire Whelan. She is due to report back to him on this in March and if Whelan advises that there should be a referendum, then a referendum will be held, said Kenny. The Taoiseach also spoke of measures planned in 2012 to aid recovery, including a new Labout Market Activation Fund, a micro-finance loan fund for small businesses, a new scheme to assist viable businesses unable to get credit, and measures to support Irish startups. Email “Enda Kenny: Ireland faces huge challenges, but I’m an optimist”. Feedback on “Enda Kenny: Ireland faces huge challenges, but I’m an optimist”.